The official continued by saying that they examined all files from 1942 to 1966 regarding St. Nicholas' remains and found out that the church was burnt down but was reconstructed. Some merchants allegedly stole some bones from the church, which they thought belonged to St. Nicholas but belonged to a priest in reality. Karabayram was very optimistic about reaching St. Nicholas' remains, saying that they may be able to reach the untouched grave of Santa Claus, one of the most popular figures for children who celebrate Christmas throughout the world. He noted that they are currently searching for researchers from eight different fields of study to carry out the rest of the work at the site. Archaeologists at the site have already conducted groundwork and will now go into further detail to reach below the ground. The excavation leader Professor Sema Doğan was shocked to hear about the finding, Karabayram said, and added that the tourism around the region will be positively affected if they are able to successfully reach Santa Claus' untouched remains. Previously, the remains of St. Nicholas were believed to have been smuggled to the Italian city of Bari by Italian merchants in the year 1087. 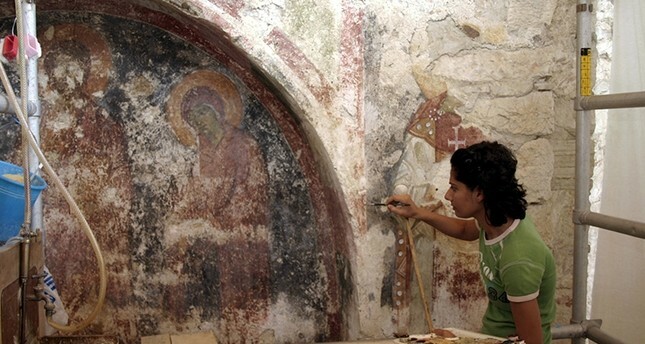 The Santa Claus Museum, formerly an ancient church with a sarcophagus attributed to the Christmas saint is located in the town of Demre. St. Nicholas, praised for his generosity, especially toward children, is venerated by all denominations in Christianity and it was this generosity that led to an evolution of his image into modern-day Santa Claus.